Mayor Eric Garcetti announced that the Los Angeles Public Library lent a record amount of e-media in 2014, demonstrating that the city's efforts to keep up with technology are well received by Angelenos. In 2014, 2,016,011 e-media items were checked out, Mayor Garcetti said, which is an annual increase of 69 percent. The introduction of streaming media increased e-music use by 600%, from 15,262 items in November 2013 to 102,147 items by the end of 2014. The library’s popular online services also include web-based real-time live homework help, which has served over 32,000 students, and more than 800 online courses and access to special digitized collections. Los Angeles is the first public library in the nation to offer adults the opportunity to earn their high school diploma online as well as a variety of career certificates. In addition, library users can now check out iPads from the Palms Rancho Park branch and children may check out Nook tablets at the Panorama City and Sun Valley branches. The Central Library in Downtown launched a “Tech Kiosk,” which automatically dispenses laptops and tablets for use within the library, and Los Angeles now is the first large library system to offer mobile printing services accessible from tablets or smart phones at 10 branches. “Our libraries are becoming one-stop centers where you can do your research, type your paper, and print—all in the same place,” Mayor Garcetti said. 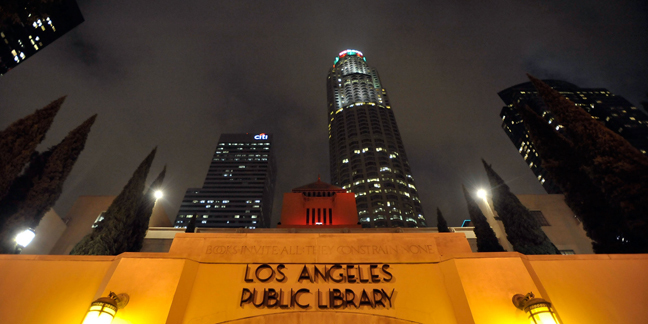 Overall, L.A.’s 73 libraries in 2014 saw 14,584,162 visits with over 15,086,605 books, DVDs, CDs, magazines and electronic resources checked out total. The library's website at www.lapl.org was the most visited city website, with almost 22 million unique visits.